Want to attend a free webinar???? Thomas MacEntee was our speaker last October and he presented this very talk. If you weren't there or would like to hear it again, here is your chance. If this "register now" link does not work from my cut-and-paste, go to www.legacyfamilytree.com and sign up there. You MUST sign up but it is free. Then come the day, about 15 minutes before 11:00, click the link and sit at your computer and enjoy.......and learn. Schrag, Washington......... did you know? 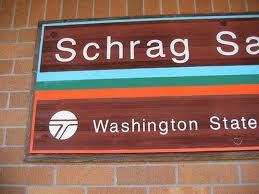 If we were asked to identify Schrag, Washington, we would think of it as a rest stop on I-90. But did you know that in 1911 Schrag had a post office and a general store stocked with merchandise for surrounding farms. The Northern Pacific Railroad line built a spur to connect with the huge Schrag grain elevators. The little town finally passed into dust in 1934. But as you zoom through the middle of Washington on I-90 and see the Schrag sign, pause to remember that there once was a town and no doubt a family named Schrag. Miriam has a birthday party! Miriam Robbins Midkiff is the 1st VP of EWGS and a hard-working gal, teacher, mother and EWGS member. She richly deserved the surprise 44th birthday party given for her at the Cathay Inn and attended by some of her school co-workers and 15 or so EWGS member-friends. If you see her soon, feel free to give her a Big Birthday hug.......... but don't ask for any cake; we ate most of it and her Matt surely polished it off. The EWGS Blog is One of Family Tree Magazine's 40 Best Genealogy Blogs for 2011! Have you heard? Family Tree Magazine has named the EWGS Blog as one of its 40 Best Genealogy Blogs for 2011! This site is all about community: It shares frequent news and information with a small but involved group based out of Spokane. Find a great page of links for those researching roots in eastern Washington state. Our blog was listed as one of five in the Local and Regional Research category, along with distinguished blogs such as the Brooklyn Historical Society Blog, the California Genealogical Society and Library Blog (which also won last year), the New York History Blog, and the Sandusky History Blog out of Ohio. Other categories included Everything Blogs, Cemeteries, Technology Blogs, Heritage Groups, Research Advice, New Blogs, and My Family History. Go here to see the complete list and to add the entire 40 to your Google Reader account. 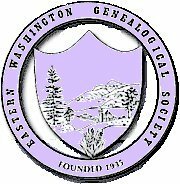 The EWGS Blog is written by a team of bloggers: Charles Hansen, Miriam Robbins Midkiff, and Donna Potter Phillips, each of whom writes at least one other genealogy blog of their own! We encourage you to check out the links and widgets in the sidebars of this blog (if you're viewing this message in a feed reader such as Google Reader, or have subscribed to receive posts in your email, you'll want to go directly to the blog to see these features) and also to visit our website. We'd also like to express our appreciation to the many individuals who nominated and voted for our blog and to the expert panel who made the tough decisions of whittling down the list to just 40 winners! If you are a Legacy Family Tree genealogy software user, or are simply curious about this genealogy software program, you may be interested in the Legacy Users Group (LUG), which will meet next Wednesday, March 16th, from 1:30 to 3:30 PM in the meeting room of the Shadle Park Branch of the Spokane Public Library at 2111 W. Wellesley. This meeting is free and open to the public. Regular attendees will take turns in the role of moderator for each meeting. If you have more questions, please contact Donna Potter Phillips here. If you do not recognize this place, then may I politely say "shame on you?" This is our wonderful Genealogy Section in the downtown Spokane Public Library. I took this moments before the doors opened and a dozen folks, helpers and seekers, came happily into the area, all intent on learning more about their family's history. Helpers from EWGS are there on Tuesdays; perhaps you should come down for a visit? EWGS enjoyed the "Bing thing"
EWGS was well represented at the "Bing thing" today..... the Bing Crosby Family History event at Gonzaga, sponsored by our state library. I estimated that half the group was from EWGS. If you weren't there you missed a fun day. Howard Crosby, Bing's nephew and former golfing partner, knew his uncle well and shared some great stories about Bing. In his day Bing was a much bigger sensation that Elvis, the Beatles or Michael Jackson ever were. But according to Howard, he was a really great guy. Wanting to take a good class? These two classes are $25 each. Centerplace, Room 209 -- This class is $49. Call 279-6030 or click to www.ccs.spokane.edu/ContinuingEd for more information or to register. Miriam is a knowledgeable and enthusiastic teacher and you will enjoy and learn from any of her classes.